Butterscotch Haystacks are a classic in my family. My Grandma Scheuer would always make them around Christmas time and they were never missing from a Christmas cookie platter. I haven’t made them in years, but this year I was craving them. 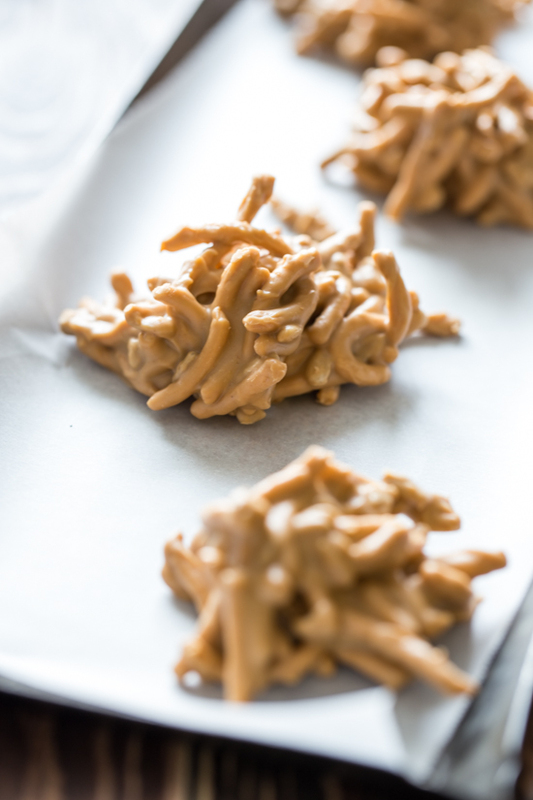 The problem is, her recipe calls for peanut butter, so I decided to experiment with some Peanut Free Butterscotch Haystacks, and I was very pleased with the results. In place of the peanut butter, I decided on sunflower butter (I used SunButter). My grandma’s recipe had peanut butter and peanuts in it, so I figured a good substitute would be sunflower seed butter and sunflower seeds. See where I’m going with this? Anyway, I turned to my resident mini taste testers, who are always happy to indulge me in my experiments, and they were a resounding hit! My big taste tester loved them, too. In fact, the next morning he came down wondering if there were any ‘butterscotch thingies’ left. There were only a few left, unfortunately. 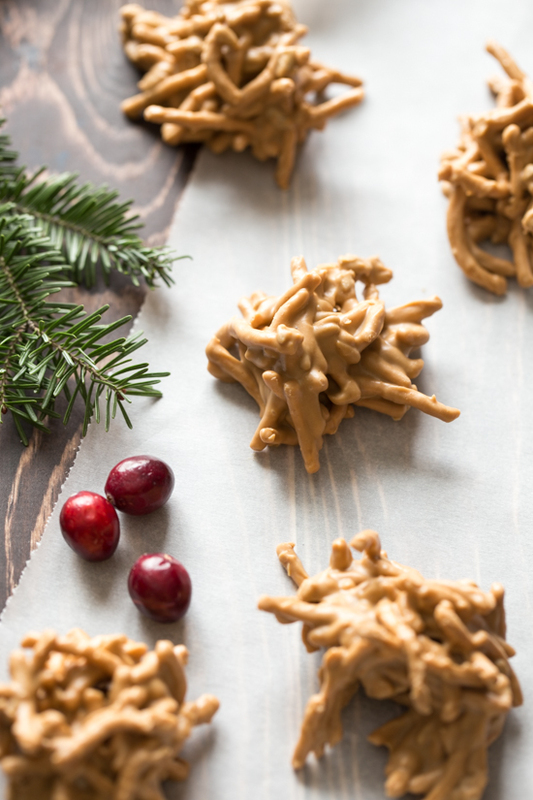 These salty, sweet Peanut Free Butterscotch Haystacks are awesome for any cookie tray. The only thing I would do differently next time, is make them a little smaller. I had them in about 2 heaping tablespoon amounts and they were a bit difficult to bite into. So, when scooping these out, less is more. You can always go back for seconds, right? Maybe make two batches just to be on the safe side. Place butterscotch chips and sunflower seed butter in a medium bowl. Microwave on high for 30 seconds, then stir. Microwave in 15 second intervals, stirring between each time, until mixture is melted together. Add sunflower seeds, chow mien noodles and salt - stirring gently to coat. 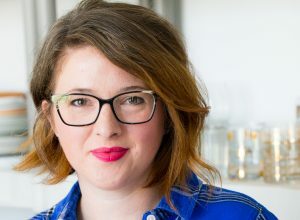 Drop mixture by the tablespoon on parchment lined baking sheets. Chill until set. If you use salted sunflower seeds, reduce salt to 1/8-1/4 teaspoon. These remind me of being a kid! So cute, I love the swap out of peanut butter for sunflower butter! Yes! I know, I can’t see these little butterscotch things without thinking of being little 🙂 I’m glad you like the looks of them, Nicole! Merry Christmas!! I could easily eat 6 or 8 of these without blinking an eye! I am thinking about trying this recipe with my preschool class. Can you tell me how long they took to set before you could dig into them? Thanks! If they sit at room temp, they take at least a half an hour to set. If you have access to a refrigerator just pop them in there and they’ll be ready in about 10 minutes!